Greek geometer; flourished in the fourth century B.C. He is mentioned, perhaps for the first time in Hebrew literature, by Rabbi Abraham bar Ḥiyya (d. 1136). Jacob ben Nissim also speaks of . Most of the oldest Hebrew manuscript now extant are translations of Euclid strikingly similar in style and method, and are apparently the work of the same man, Moses ibn Tibbon. As he usually dated his worḳs, it is learned that the first translation of Euclid's ςτοιχεα ("Elements") was made in Elul, 5030 (= 1270). Another translation, called "Yesodot" or "Shorashim" (c. 1273), and including Hypsicles' books, is commonly supposed to have been made by Jacob ben Makir (died about 1306), though some attribute it to Moses ibn Tibbon. Not only was the text itself translated into Hebrew, but also the commentaries on it by Arabic scientists. Those made by Al-Farabi and by Ibn Ḥaitham (known as "Alhazen") were rendered anonymously, probably by Moses ibn Tibbon. Kalonymus ben, Kalonymus, the assumed translator of part of book xiv., according to Simplicius' commentary (Feb. 2, 1309), also rendered Ibn Ḥaitham's commentary on the introduction to book x. (Sept. 9, 1314; Berlin MS. No. 204). Other commentaries, original and adapted, are by a pupil of Jacob b. Makir, by Abba Mari (c. 1324; Munich MS. No. 91) on the introduction to book i., by R. Levi ben Gershon (d. 1344) on the propositions of books i., iii., iv., v. (MSS. Jews' Coll., No. 138, 4; D. Guenzburg, St. Petersburg, No. 340), and by Abraham ben Solomon Yarḥi Ẓarfati. According to Joseph Delmedigo, there was also an original commentary to the entire Euclid by Elijah Mizraḥi (d. 1526). The "Elements" are usually divided into books ("ma'amarim"). An annotated translation of book i. and part of book ii., belonging to the sixteenth century, is still extant (Paris MS. No. 1015). Euclid's "Data" was rendered into Hebrew (c. 1272) by Jacob ben Makir, and called by him "Sefer ha-Mattanot" (Book of the Gifts), from the Arabic of Ḥunain ibn Isḥaḳ ("Kitab al-Mu'ṭayat") as revised by Thabit ibn Ḳurrah. Tibbon, however, speaks of Ḥunain ibn Isḥaḳ without reference to the reviser. Ḥunain's version of Euclid's "Optic," as revised by Thabit ibn Ḳurrah, was translated into Hebrew by Jacob ben Makir and called "Ḥilluf ha-Mabbaṭim" (The Variety of Aspects). 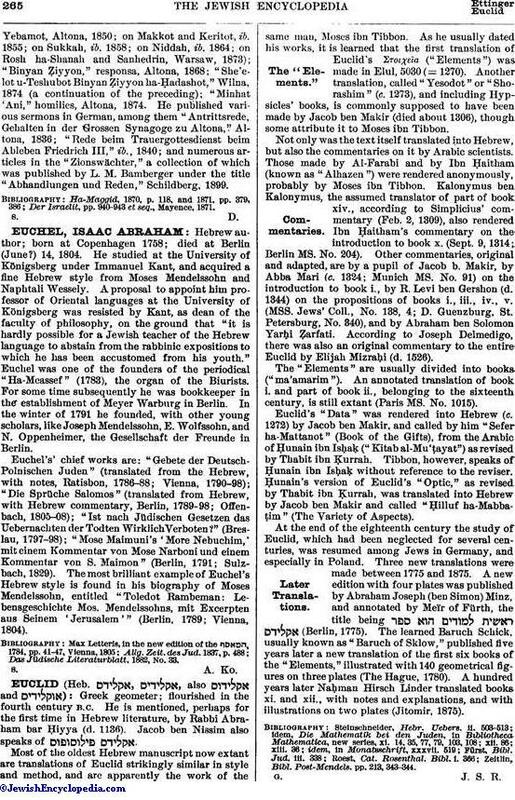 At the end of the eighteenth century the study of Euclid, which had been neglected for several centuries, was resumed among Jews in Germany, and especially in Poland. Three new translations were made between 1775 and 1875. A new edition with four plates was published by Abraham Joseph (ben Simon) Minz, and annotated by Meïr of Fürth, the title being (Berlin, 1775). The learned Baruch Schick, usually known as "Baruch of Sklow," published five years later a new translation of the first six books of the "Elements," illustrated with 140 geometrical figures on three plates (The Hague, 1780). A hundred years later Naḥman Hirsch Linder translated books xi. and xii., with notes and explanations, and with illustrations on two plates (Jitomir, 1875). Zeitlin, Bibl. Post-Mendels. pp. 213, 343-344.